Tested it at ~20 hrs run time. I split them into two 10 series packs, so I can charge them with my iCharger in parallel. Will fit nicely on the back once I clean up wiring and get some velcro. If you had fun shorting things ... don't short those cell packs !! Also keep in mind that one thing the line cord provides is a case ground. Without that, you can easily have a scope chassis that has enough voltage on it to kill you. Ha! shorting these is no biggie. Thanks for the advice. Do you think I should connect the battery negative to ground? Or how else to mitigate this without grounding to mains? We shorted the whole Tesla pack before pulling it apart. I think I would have stuck to a 12S pack or similar to keep the weight/size down. 12s would have been useless for other stuff, furthermore 12s is too low voltage. If I wanted it tiny I would have done 20s1p. This pack is 40 cells. It' barely makes the scope bigger, way more portable then lugging the mains cord. 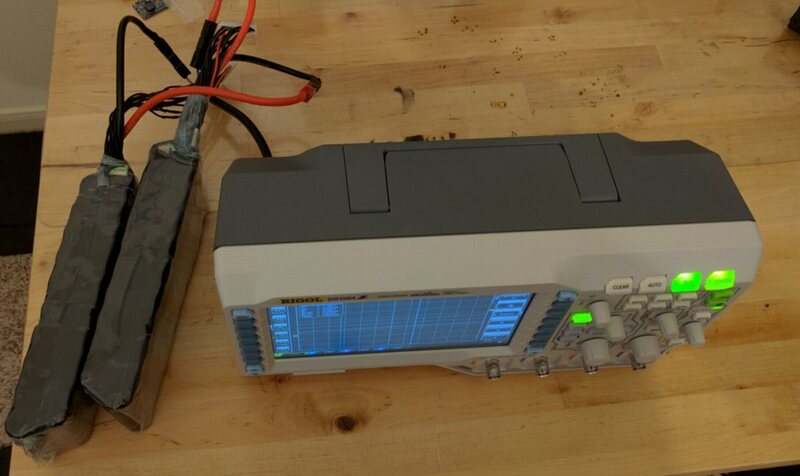 Wouldn't be easier and safer to use a power line isolation transformer to feed the scope ? If those are unprotected lithium nickel cobalt cells (NCR18650A ? ), as all straight high density Li-ion they are quite dangerous. I would say : do not try this at home ! They are quite safe - I've made dozens of packs from these cells by now and we've conducted a lot of abuse testing. They can handle almost everything without thermal run away or any drama - overcharge, crush, storage at 0v, dead short. The only things that cause thermal run away are penetration (nail, etc) and heating them above 230°C - neither of which will be happening on the back of my scope. OK, so you relied on safety wire fuses placed in series with every single cell, without those the result would have been utterly different. It was a battery pack from a defective/wrecked car ? AFAIK those are quite expensive. We didn't "rely" on anything. If the module didn't have fuse wires, it would have hit 3,000 amps or so, which would have fused the 4awg wire. It would just have been a little more dramatic. I wonder if those have an integrated safety PTC. Are they actually Panasonic NCR18650A ? Do you have any details / links to the batteries? What did the pack cost? If you are able to give any details, it would be appreciated. So i assume you put a fuse nearby every battery pack. I just took a YouTube toor on DIY battery packs, in some cases straight Li-ion cells hand soldered without any kind of protection/balancing circuit, quite scary things IMHO. Velcro I ordered came. worked perfect. 3M heavy duty stuff. Almost too hard to pull it off..
Just need to shorten and clean up the wiring. I'm into RC flying and actually thought about trying Lipo packs to do the same. Very nice work. Very nice indeed. 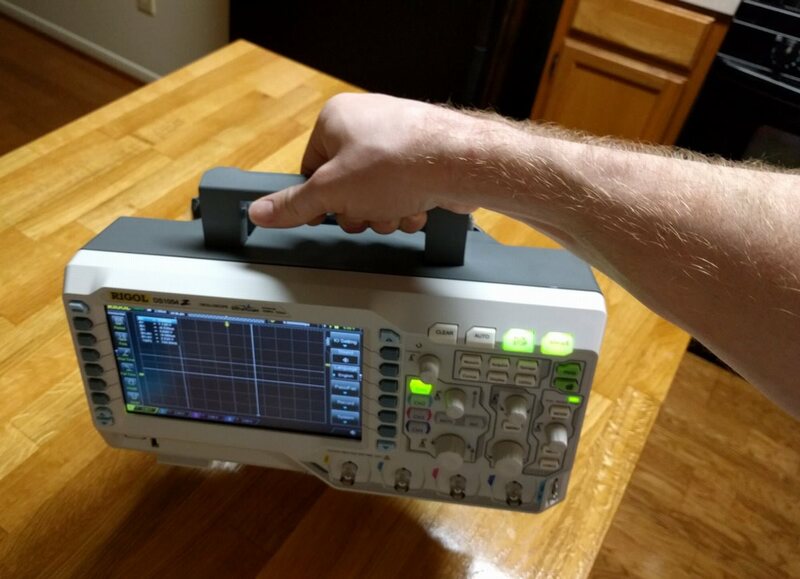 It's funny because the truly nice handheld scopes (by nice I mean of decent quality and feature rich) are dang near that same size anywho. I say, "Good on ya mate!" Trouble is you've made it only half safe. While you have removed the chance of mains ground loops there's still all the BNC shells commoned so there's still potential for Reference (GND) lead loops by way of non-common points of connection for the probes Reference (GND) lead. Furthermore one still has the rated channel 300V inputs and while using one channel you might be able to now exceed that, definately not using 2 channels or more. 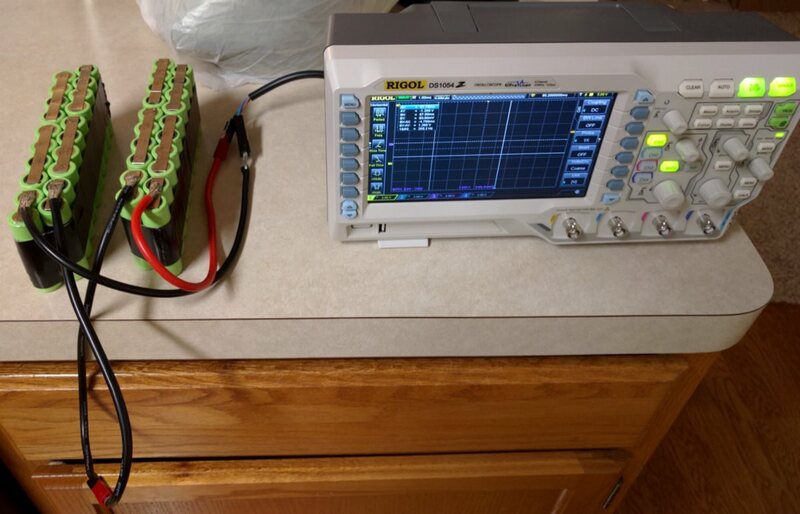 An Isolated channel DSO or Differential probes are the proper solution. Portability, yep you've accomplished that. NCA chemistry as NCR18650BD, but with lower discharge rate and price. 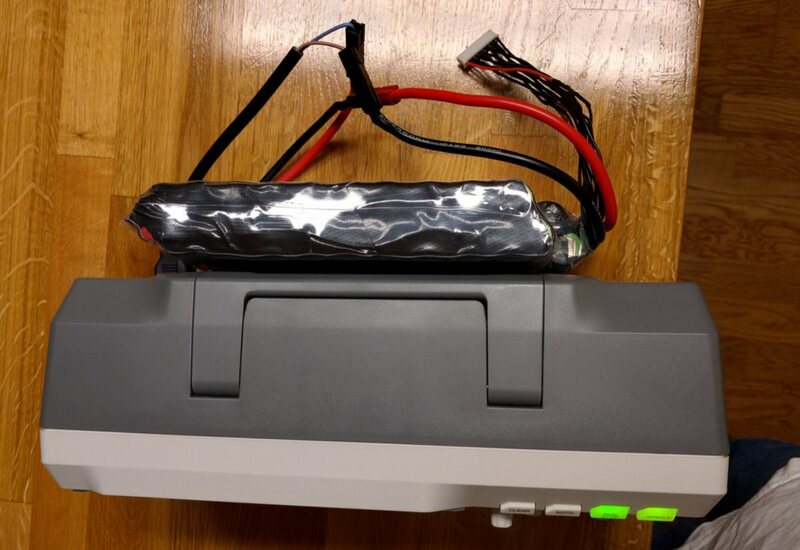 safe building battery pack starting from single naked cells requires skill and equipment, they must be spot welded together using nickel strip for contacts, sure not iron soldered. 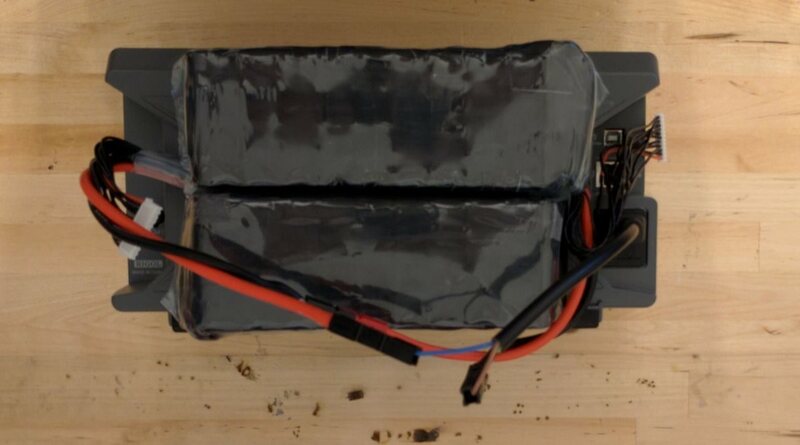 As all other Lithium Nickel Cobalt Aluminum Oxide cells are safer than older Li-Ion chemistries but not "intrinsically safe" and there is still risk of explosion or fire. Ideally they should be fitted with protection circuits to provide charging / discharging voltage cut-offs and overcurrent trip. It's true that sourcing the DS1000Z scope it's a soft task for them but also normal handling requires some care. there is additional electronic inside the black plastic wrapping ? Is the white connector wired to the battery pack suited for a balanced charging system connection? I remember a thread here about battery powering the 1054. Cool to see someone made one. Thanks for sharing. For polish, perhaps put the packs and wiring into a nylon pouch affixed to the rear to look like an accessory pocket for probes, etc. Yes, of course, I put a voltage tap for each cell on each 10 series pack. This way I can balance charge them with my iCharger. Like I said, I expect the packs last 15 years. Upper and lower voltage "protection" are not necessary. I can just use a volt meter display if I want to watch voltage so they are not over-discharged. Either way, they can handle an over discharge just fine if an accident occurs, like I forget to turn it off. The scope will shut off anyhow near 40V, which happens to be high enough so that the pack is not over-discharged too much. There is no risk of fire or explosion here. You base your experiences on Hobby King Lipos and Chinese made 18650's. These cells are in another league in quality and design. 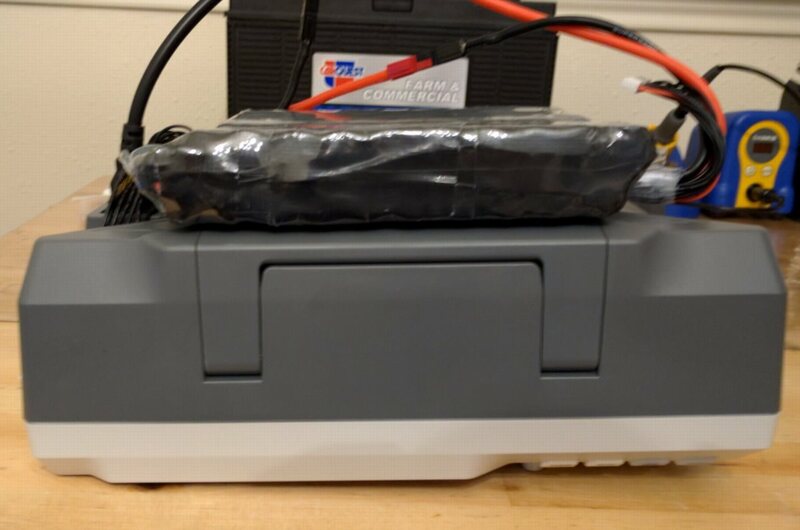 I know quite well the matter having developed (actually several years ago, when dedicated IC's were not available) a uC based custom Li-ion battery charger used inside a mobile device. I also tinkered for years with high power led flashlights, where Li-Ion cells are inside a robust metal pipe that could easily become a small bomb, so i have always been very conservative using only quality IC protected battery with Sanyo & Panasonic cells inside. 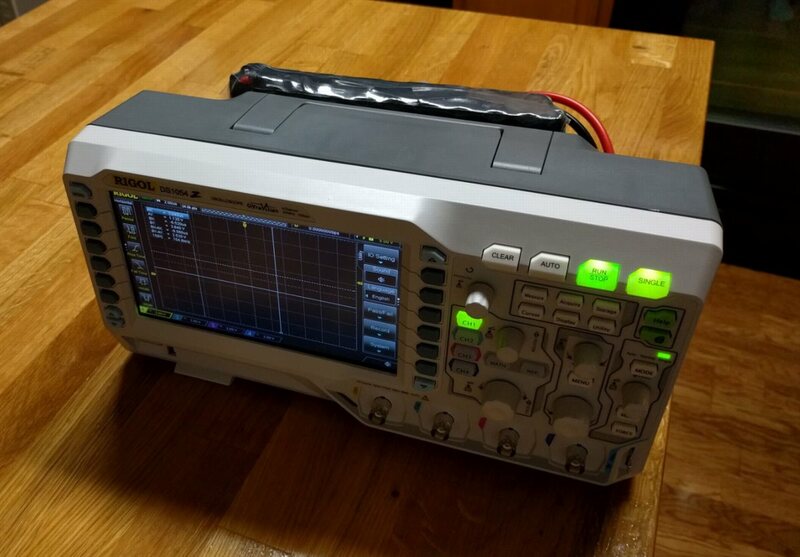 For this kind of application (battery operated DS1000Z) could be enough to use a total of 16 cells in series, keeping the overall cost within 60-80 USD (plus charger) of course with reducted lasting respect your pack topology. 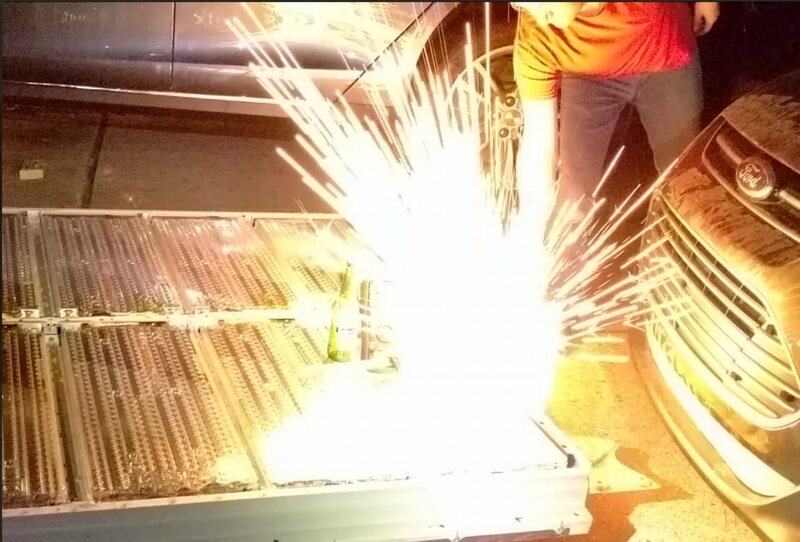 Just out of curiosity : why that Tesla battery pack was "scrapped" ? Why not just directly supplying 14V to the DSO and regulate it to 12V (as I think they are using as secondary voltage) and just skip the Primary voltage? Did it with my old Rigol once, worked perfect using a 4S Lipo.